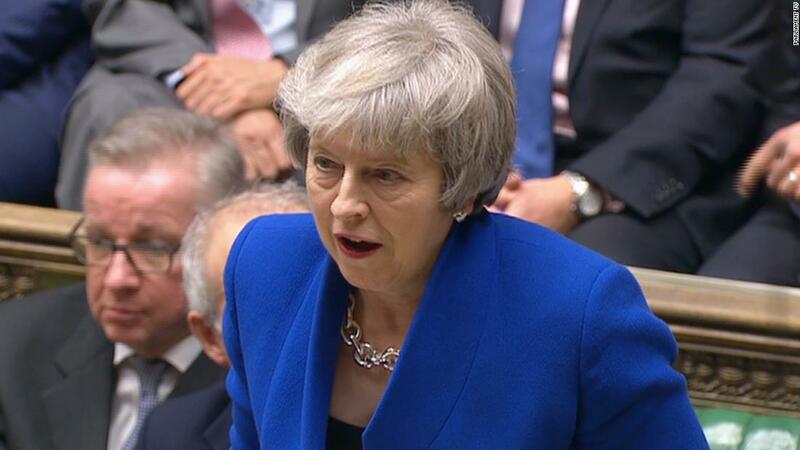 Earlier: May took a hammering in parliament over her handling of Brexit during Prime Minister's Questions, hours after her plan was crushed in a historic defeat. Reality check: What just happened?! Theresa May's government survives a no-confidence vote. They will now enter cross-party discussions in an effort to resolve the withdrawal deal impasse in Parliament. May says she will return to the House of Commons on Monday to outline how she plans to move forward. Opposition leader Jeremy Corbyn says he will boycott talks until May rules out the option of a no-deal Brexit. Our live coverage of the day's Brexit developments is now coming to an end. But head here for the latest movements on this story. Moments ago, British Prime Minister Theresa May took to the podium outside Number 10 to address the nation. "I understand that [for] people getting on with their lives away from Westminster , the events of the last 24 hours have been unsettling," the British leader said. "Now MPs have made it clear what they don't want, we must all work constructively together to set out what Parliament does want." May said she had already conducted meetings with the Liberal Democrats, SNP and Plaid Cymru. She added that talks between several other parties would take place tomorrow and expressed her disappointment over opposition Labour leader Jeremy Corbyn's refusal to participate. "The door remains open," she said. Opposition Labour leader Jeremy Corbyn tweets that UK Prime Minister Theresa May's first steps for all party discussions must be to remove the option of a no-deal Brexit. His tweet was accompanied by a video from the House earlier tonight where Corbyn called for May to take the option off the table. A spokesman for Opposition Labour leader Jeremy Corbyn confirmed Downing Street reached out to the party ahead of tonight's vote over potential cross-party discussions, the UK's Press Association reports. Accounting for Corbyn's position on the no-deal course of action, the spokesperson said: "The blackmail is that by attempting to run down the clock and hold the threat of the country going over a cliff-edge into a no-deal outcome...that makes it more difficult to reach a real and effective deal." British Prime Minister Theresa May is expected to make a statement outside 10 Downing Street at 10 p.m. (5 p.m. ET). Opposition party "needs to be clear on obstacles to deal"
Conservative MP Guy Opperman tells CNN that Labour needs to stop playing politics and come to the table. "I’d like Labour to stop playing politics, get round the table, and identify specifically what in the withdrawal agreement and the political agreement they manifestly disagree with, because until they spell out their position – and the other parties, but the main one is Labour – we don’t know where the common ground is," Opperman said. While most parties welcomed an invitation to discuss the Brexit impasse tonight with Theresa May, it's not going to be a straight forward affair. Lawmakers from the SNP, Labour and Liberal Democrat parties all emphasized the importance of taking the option of a no-deal Brexit off the table. Here's a breakdown of how lawmakers in the House of Commons voted tonight. The Scottish National Party's leader in Westminster, Ian Blackford, says he will embrace the offer for all-party talks with Theresa May and her government. He adds: "However, I do think it is important in that regard that we make it clear to the prime minister, in the spirit of openness in these talks, that the issue of extending article 50, a people’s vote and avoiding a no deal have to be on the table." Opposition Labour leader Jeremy Corbyn is called on a point of order but lots of jeering from the benches interrupts his start. After House speaker John Bercow brings the room to order, Corbyn outlines the numerous government defeats of recent days. "Last night the House rejected the government’s deal emphatically. A week ago the House voted to condemn the idea of a no deal Brexit. Before there can be any positive discussions about the way forward, the government must remove clearly, once and for, all the prospects of a catastrophe of a no deal Brexit of the European Union and all the chaos that would come as a result of that. And I invite the Prime Minister to confirm now that the government will not countenance a no deal Brexit from the European union." Throughout the entirety of Corbyn's remarks, the chamber is filled with raucous jeering.